SAGE meets weekdays from 11 a.m. to 4 p.m. Lunch is served every Tuesday at noon, with a social hour from 11 a.m. to noon. A foot care clinic is held on even-numbered months, a blood pressure clinic the last Tuesday of the month, and senior exercise sessions are held twice monthly. BINGO is played after each luncheon until 2:30 p.m. Reservations are required with a $3.50 suggested donation for those over 60. Meetings are held every Tuesday at this location. Bridge is played every Tuesday. All are welcome, but a partner is required. Meets the 4th Tuesday of each month. Call for location. Interested in learning how to combine outdoor writing and sketching with your joy of exploring nature? Join the Deschutes Land Trust and hiker and passionate journaler, Kolby Kirk, for an evening of learning tips and techniques for keeping a journal while exploring nature! We'll discuss ways of seeing and recording the landscape, explore reasons for keeping a trail journal, and learn tips for quickly sketching flora/fauna for later identification. No journaling experience needed. Free, every Tuesday! Sign-up is at 6:15 p.m.
Drills take place every Tuesday. Doors open at 6 p.m. for social hour, with the speaker at 7 p.m. Dr. Daniel Lowd presents "Algorithms and Artificial Intelligence: Science Takes on Fake News." $5 admission for the general public, but teachers, students, and science club donors are free. Meets every Wednesday at 7 a.m.
All are welcome! The club meets every Wednesday in the community room at Ray's. The organization’s mission is to provide veterans and current members of the military with the opportunity to share friendship, camaraderie and assistance. Meetings are held every Wednesday. Meetings are held every Wednesday. NAMI Central Oregon, the local organization of the National Alliance on Mental Illness, will offer its NAMI Basics Education Program for the spring beginning April 17. It will be held on Wednesdays from 6:00pm to 8pm at St.Charles Medical Center Bend Conference Room D. NAMI Basics is a free, six-session program designed for parents and other family caregivers of children and adolescents with emotional and behavioral difficulties. NAMI Basics helps parents and other family caregivers of children to understand the illnesses that are causing those behavioral difficulties, and the critical role families play in the treatment of those illnesses. The program is taught by trained teachers who are also the parents or family caregivers of individuals who experienced emotional or behavioral difficulties prior to age 13. Meets the 2nd and 4th Wednesday of each month. Every Wednesday at 7 p.m. in the upstairs room! $20 per person. Meets the 4th Thursday of each month. Meetings are held every Thursday at this location. Novices welcome! The club meets every Thursday. Meetings are held every Thursday. Call for location. Every Thursday, a different wine is featured and hosted for the free tastings! Meetings are held every Thursday and Sunday at 7 p.m. at this location. Meetings are held every Friday at noon for one hour, open to everyone. Buy & Sell Used Bikes & Gear! Hosted at Thump Coffee Roasters. Item check-in Friday. Open swap hours Saturday 10am - 6pm & Sunday 9:30am - 3pm. Galleries and shops feature live entertainment and refreshments, every fourth Friday of the month! April 26, 2019, 4-7 pm, Fourth Friday Sisters Arts Stroll at Hood Avenue Art features monotypes by Gin Laughery and hand-crafted, dichroic glass jewelry by Berta and Rex Heisler of Zantana Dichroic Jewelry. These artists from Redmond, OR, bring deep, rich, and gorgeous colors reminiscent of the sky and the light of Central Oregon into the gallery. Exhibit runs: April 24-May 21, 2019. 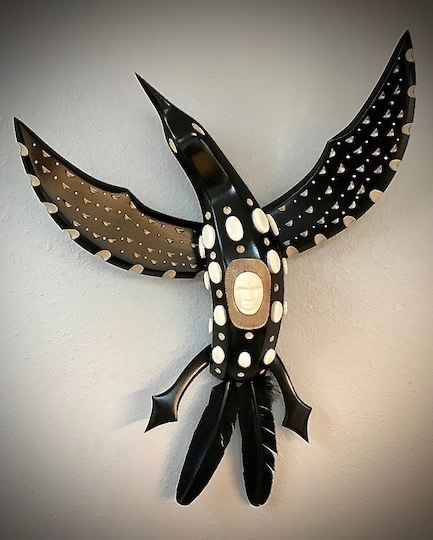 Join us at Raven Makes Gallery to welcome three award winning Alaska Native artists; Don Johnston, Aleut, baleen basket weaver, Terresa White, Yup’ik Eskimo, sculptor, and Mark Tetpon, Inupiaq, carver. These artists intimately capture and express unique relationships with the natural and cultural world of the Arctic. Three day show; Friday evening opening reception, demonstrations Saturday, exhibit through Sunday. "The Book of Help" is the story of one woman's life-long quest for love, connection, and peace of mind: 15,000 hours, four decades, six continents, and 290 trial remedies. No cover! Note that karaoke doesn't take place on nights when live music is scheduled. ALSO on Fridays at 5 p.m., enjoy the Prime Rib dinner special with dinner salad, loaded baked potato, and 10 cuts. It usually sells out by 6 p.m.! Meetings are held every Saturday at this location. Meetings are held the 4th Saturday of each month. No cover! Note that karaoke doesn't take place on nights when live music is scheduled. Meetings are held every Monday. Meetings are held every Monday at this location.